What does your guardian angel look like? 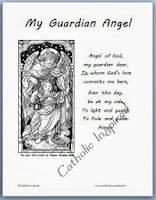 Do you know your guardian angel's name? Our guardian angels have been with us since the moment of our conception and they know everything about us, yet we know so little about them. Well, we may not know what our guardian angel looks like or what their name is, but we do know that God created them and they are to be our protector and guide through life. So I recommend that you talk to your guardian angel and thank him/her for all their help! I made a printable page for my kids to color and complete. This page is meant to get them thinking about their holy guide and protector. 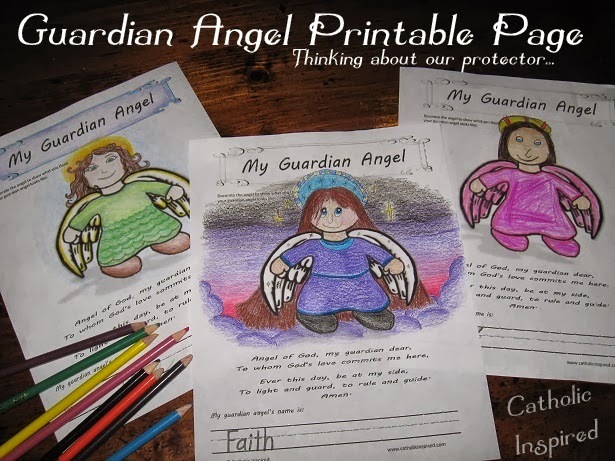 They can color and decorate the picture of the angel so it will look like what the child thinks their guardian angel may look like. Some people believe that guardian angels look like the person they are protecting. Do you think that could be true? Or do they look different? Let the child decide how they think their angel may appear. Then, after they have finished decorating the angel picture they can write the name they think God may have given to their guardian angel. There is space on the bottom of the page to write this*. *NOTE: The Church discourages naming your Guardian Angel. The area at the bottom of the page is for the child to speculate/guess what name *GOD* may have given to the angel. It is NOT to encourage naming angels. Please, follow the churches wishes. Thank you. Visit our site to download these for FREE! There are three printable pages to choose from! ...and this page includes a face - for younger kids. 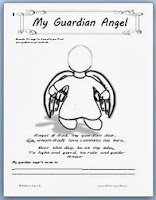 All the Guardian Angel pages include the Guardian Angel Prayer. All of these pages are free! Guardian angels are God's wonderful gift to us. We need to thank them often for all they do to help us. And when you are feeling low or unsure of things talk to your guardian angel. They are always there and ready to listen! Thank you, Jennifer. I hope that St. Michael protects your home. May God bless you and your family! I can't seem to open the pages to print? 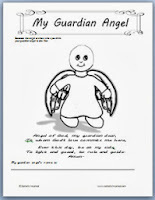 I help run a small children's group in my church and had a dream about my guardian angel the other night! Got me thinking how little our kids sometimes know about theirs. 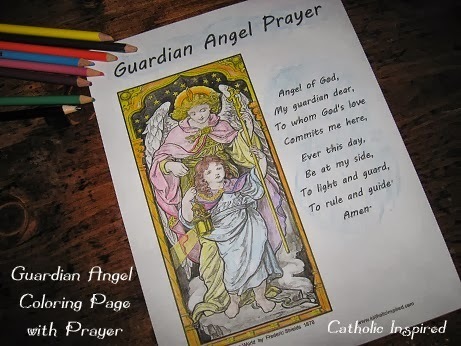 I was going to look up some pages to print and Our Guardian Angel prayer before our meeting. I went on facebook for a browse and their was your post!! Truly Heaven sent. L O V E your site and the crafts and coloring pages are always a hit! God Bless and keep up the good Work! Isn't that so neat when that happens! God is amazing! (g) Thanks for the comment! God bless you in all the work you do in His name! Jennifer, I have a question... I am a new Catholic convert - so I am still learning! :) I LOVE the printable and plan on using them today for our craft (you've been a GOD send by the way as I have been trying to find crafts to do with my littles!!!).. Anyway, I have read that naming our guarding angels is not encouaged by the Church. Here is what I read: The practice of naming guardian angels is discouraged by the Church: "Popular devotion to the holy angels, which is legitimate and good, can, however, also give rise to possible deviations . . . [such as the] practice of assigning names to the holy angels [which] should be discouraged, except in the cases of Gabriel, Raphael, and Michael whose names are contained in Holy Scripture" (Directory on Popular Piety and the Liturgy 217). But I have changed the wording a bit on the post/sheets above to make that more clear. It is God that names the angels, we are simply guessing as to what their names are. If we call them by this name it's more like a "nickname". Yes, you are correct. We are NOT to name our Guardian Angel. Naming something means Authority over- God gave the animals to Adam to Name (Authority), Parents name their children (Authority), an exorcist tries to get the name of the demon/ fallen angel (to gain more Authority over), God will give all of His Saints new names in Heaven (Authority over), etc. We are not over the Angels, they are pure Spirits and only God has authority over them. Nor should we try to get their name, as one has no way to know for sure 'who' is giving said name, and we definitely do not want to pray or give thanks to a demon :(! Yes, Heather is correct. Follow what the Catholic Church asks. (No naming of angels, etc... ) I'm sure that the church has found people who are doing questionable things as they name angels. (besides, angels already have names given by God.) But I'm sure there are many people who have given their angel a name and never meant to do any harm or be against the church. The problem is in GIVING names not in knowing the name. Knowing names does not give us authority... I know St. Micheal's name and I don't feel I have authority over him. I know Mary's (Our Lady's) name and I don't feel I have authority over her. The Church has not given Mary or Michael those names we know them through the Bible. And yes, it is best to be careful to not ask for your angel's name. The knowledge my be from an evil source. But no matter what you call your angel (My Guardian, My Friend, Protector, etc...) They know you are speaking to them. And they can even hear your heart. We are all Catholic, let's NOT act as enemies. Pope Francis has asked that we don't bicker over things like this, so try to be understanding of each other in a respectful manor. Who's going to want to join a church of arguers? Ah!! YES! That does help and makes sense!! Like I said... I'm still learning!!! :-? That is one thing I LOVE about this Faith, there is SO much to learn and SO much beauty in it. I don't know if you have read my conversion story, but if you are interested it is here: http://chelseythall.com/our-faith-journey It has been a very hard road, BUT so, so, so worth it! Wonderful! And by the way: I'm still learning, too. That never stops! Our faith is, too, rich to learn quickly! Thanks for the link! I'll stop by to take a look later (when I have a few free minutes). http://taylormarshall.com/2011/06/you-are-not-allowed-to-name-your.html I thought this was a really cute idea, until I saw the name space at the bottom. The name space at the bottom is for the child to write what name they think *GOD* may have given the angel. They can speculate that just as much as they can speculate what the angel looks like.